My neighborhood consists mostly of houses, a local elementary school, well-tended lawns and a variety of trees. It’s like most suburban developments except for an occasional aberration like I noticed yesterday. 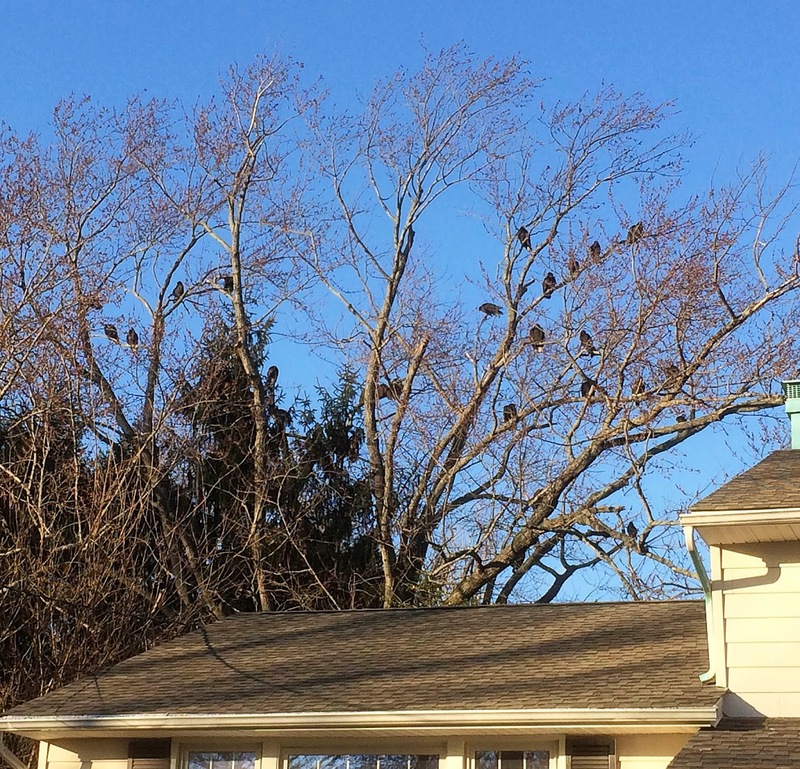 It seems that a clump of trees has become home to a bunch of turkey vultures. I've seen these birds soaring overhead more frequently this year. Sometimes they come fairly close to rooftops and float over backyards. They usually come in groups, tilting their wings to catch the updrafts and maybe spot some carrion to eat. They aren't exactly cute but they are impressive. Why are they here? These birds used to be seen mostly in the southern states but since our climate has been warming, they now have moved to the north and have even been spotted in Canada. The world of nature is shifting as we can see by the weather forecasts this season. We are expecting temps in the 70s for the next few days. I wonder what the birds will think of that. Perhaps we all need to be flexible as our world changes. Turkey Vulture Identification, All About Birds, Cornell Lab of Ornithology https://www.allaboutbirds.org/guide/Turkey_Vulture/id: Size & Shape. Turkey Vultures are large dark birds with long, broad wings. Bigger than other raptors except eagles and condors, they have long "fingers" at their wingtips and long tails that extend past their toe tips in flight. When soaring, Turkey Vultures hold their wings slightly raised, making a 'V' when seen head-on. Turkey Vulture | National Geographic, https://www.nationalgeographic.com/animals/birds/t/turkey-vulture/: Turkey Vulture. The most widespread vulture in North America, the turkey vulture is locally called “buzzard” in many areas. A turkey vulture standing on the ground can, at a distance, resemble a wild turkey. It is unique among our vultures in that it finds carrion by smell as well as by sight. https://www.eastcountymagazine.org/bird-talk-wild-turkeys-and-turkey-vultures: Nov 17, 2011 - So this edition of Bird Talk is on the wild turkey and the other turkey namesake bird, the turkey vulture. The wild turkey is not native to California, although it is native to North America. Numerous attempts to introduce the turkey to California failed. Then in the early 1990s a second attempt was successful.